Since we've nestled into our downtown studio, Jennifer shares with 495GR why we moved and how we are positioned to catalyze our clients' visions for luxury residential and cutting edge commercial interiors. So, What does the future look like for Jennifer Butler Interior Design? Grand Rapids is such an exciting market to be a part of right now. We are centrally located in a region that is experiencing tremendous growth in housing, multi-family units, mixed use developments, and so much more. Businesses and residents from all over the country see the value in making the Grand Rapids area home, and we are a valuable resource for those relocating to and establishing themselves in our community. We focus on personalized service, exceptional quality and attention to detail, that is what distinguishes Jennifer Butler Interior Design and why loyal clients return to us again and again. 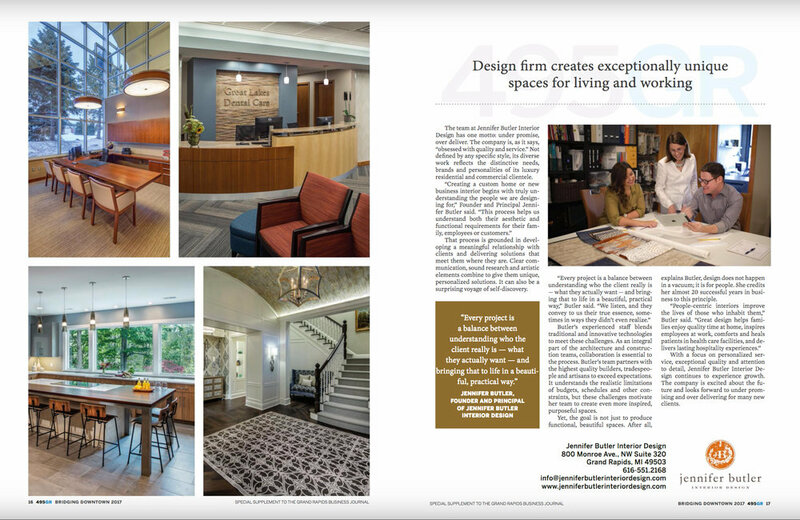 Our growth as an interior design studio continues to follow a similar trajectory to the growth that the wider Grand Rapids region is experiencing, making us better equipped to serve the needs of residents and growing businesses. We’re excited about the future and look forward to joining you in your next adventure!